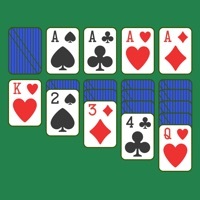 Train your brain with a daily dose of Solitaire! This modern take on a classic card game will keep you sharp. Simple and intuitive gameplay with a minimalistic design so that nothing gets between you and the game. Try it out! FEATURES: -Draw 1 card -Draw 3 cards -Easy to read cards -Intuitive tap to play -Intelligent auto-complete -Right or left handed play -Auto-save, so you never lose your progress -Unlimited undo -Statistics How to Win: ---Move all 52 cards up to the four foundations in sequential order, Ace to King, for each suit Klondike Rules: ---There are 7 Tableau columns with the last card of each face-up. Any face-up card can be moved onto another card on the Tableaus if it is in descending order of alternating colors, e.g. 8 of Hearts on a 9 of clubs or Jack of spades on Q of Diamonds. You can also move multiple cards at a time if they are already in descending order of alternating colors. In addition to using cards from the Tableaus, you can also play cards out of the Stock/Deck. You can choose (in settings) if you would like to pull 3 cards or 1 card at a time from the Stock. When a Tableau column is completely empty, the available space can be filled with a King. As they become available, cards from Ace to King can be moved from the Stock or the Tableaus to the Foundations. We are here to help: ---You will learn quickly we promise! If you get stuck, tap on any card and the app will automatically make a valid move if one exists. 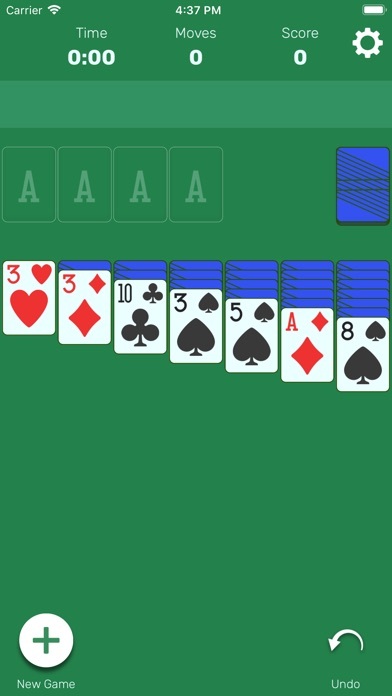 I really enjoy playing solitaire. My 1st game wasn’t that great I have to admit it felt forever I’m not sure why. Maybe next time I’ll enjoy my game sorry. It just has one card out at a time in your hand but otherwise it’s just solitaire. I don’t think it automatically does anything by double tapping so it’s all manual. I played this to earn gems for another game which I won’t get because it is awful in every way. Slow moving, bad graphics, and same deal every hand. It’s AWFUL! I like this version because it’s not a multi point contest, just a plain calm game ! I was really bored waiting, so when I was scrolling threw my App Store and saw this game I decided to play it and fell in love. This is a really fun game! I love this game! I had forgotten all the rules, so I googled them and I can win now. I’m so excited! 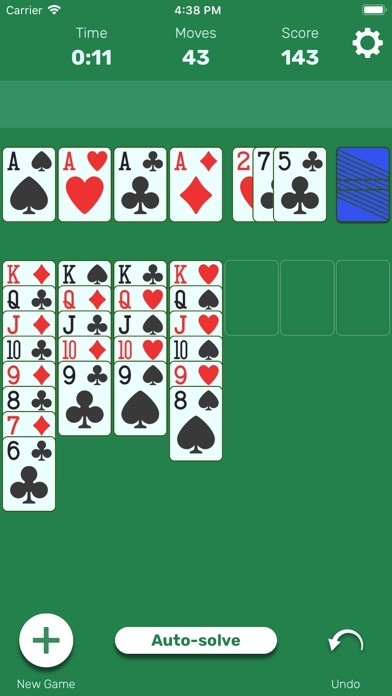 I really enjoy solitaire for passing the time. I’ve downloaded a bunch of apps, and this is the best one. I really like that unlike other apps, I’d doesn’t bother you with notifications. Fun and easy to follow. Exactly what you expect solitaire to be, I would recommend it to my friend's and family. One of my favorite card games !!! This is a great game to play. It was pretty fun and I enjoyed it. 30 second ads between every game. If you would rather look at ads then play the game, this is for you. V fun. Goes pretty quickly. Turned off the volume An now it’s Pleasant an fun to use. Awesome game to play stays interesting every round! I’ve never played before and by learning through this app and other outside sources, it’s my new favorite card game for the moment. It’s great and this app is another option apart from the traditional and classic, amazing card game. Easy and intuitive. A very relaxing and well-designed game. It is habit forming! Twice today when the ad between games came up, there was no option to get out of the Home Advisor ad. No X appeared. Just stuck at that ad. Frustrating.